As everyone now knows, Facebook is the place for ESRI Conference discussions and this one is no different. Dave Bouwman brought up a great point about ESRI allowing developers to give talks rather than just ESRI speakers (like every other developer conference in the world). It would appear given feedback on Facebook that this is going to happen (even though rumors were that it wouldn’t) with a “Demo Theater” sized space for speakers to talk to. My first thought was this is a bad idea because there won’t be enough room for some speakers, but given the proximity to the Developer Islands, this might make much more sense than stuck in a small conference room down a long dark hall that no one can find. 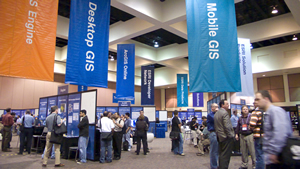 According to Jim Barry of ESRI, there will be more info and application details in the “next week or two” so start thinking about what you might want to present (or who you’d like to see present).